A foam cannon is a special nozzle that you attach to a pressure washer or a hose to spray foam soap all over an area. The most common application is in car washing, where you can get the foam into every nook and cranny and it cleans the outside to a perfect, glittering shine. We’ve put together this foam cannon buying guide to help you choose the right one for you, but let’s look at some specifications first. Capacity: Most foam cannons come with a tank that you attach with the soap in it. 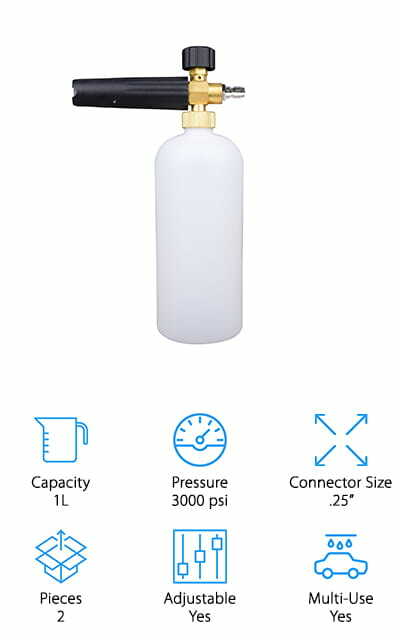 This refers to the size of this reservoir and how much soap you can carry around at one time before you refill. Pressure: This is how much pressure the nozzle can handle at its peak. Obviously, performance here will need to be measured with the power washer you’re going to be using as well, so keep that in mind. Connector Size: You want a cannon that’s going to fit on your pressure washer or water hose, so make sure that you’re getting one with the right size connector for the equipment you already have to avoid unnecessary costs. Pieces: What comes with the foam cannon? This includes the nozzle and the bottle, which is usually all that comes with one. The pressure washer is sold separately, and for most cannons, you definitely will need one. Adjustable: How many spray modes are there? Some come with such a huge variety of different spray adjustments, which is useful for a wider variety of applications. There are different settings for spreading car wash foam and other types. Multi-Use: This refers to what you can use it for. Obviously, the most common use is for car washes, but outside of that, there are a whole plethora of uses that you can put these things too. Multi-use is a great buy! Now that you know what you’re shopping for, let’s take a look at some great foam cannons that you can buy right now. We’ve built our foam cannon reviews based on a lot of research so that you know that you’re getting the best product. Our top pick and budget pick give you an idea of what’s available, and the rest of our list really gives you a variety to choose from. Let’s get cleaning! 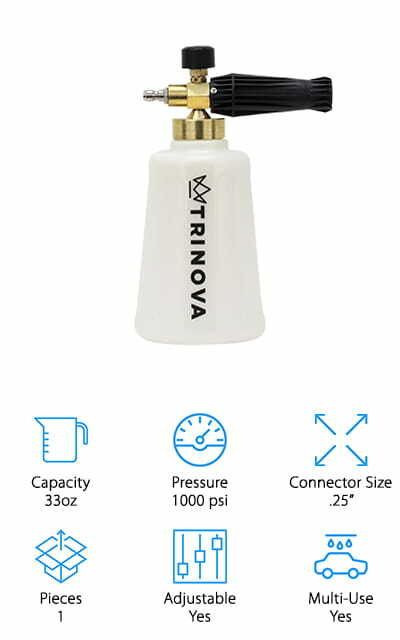 The TriNova Foam Cannon is one of the best foam cannons for sale. It’s extremely simple to use – you only need to put soap in the bottle and attach your pressure washer, and you’re good to know. A knob on the tank will tell you how much foam you’re going to spray out. It’s the top foam cannon for car washing because of the 10,000 PSI that it can handle from your pressure washer. There are a number of car-wash specific attachments that you can buy to go on this nozzle, which is pretty amazing. There is an extra wide neck on this cannon so that it doesn’t crack under the pressure. You can use this nozzle for siding, sidewalks, and even decks – any outdoor area that really needs a thorough cleaning. We love that the company has put so much thought into this product to provide you with a high-quality device. The extra car attachments are a bonus! Our pick for the best cheap foam cannon is this Fasmov device. All of the connectors are brass, which means that they will last a long time – and all the fittings are durable as well. It’s a sound device that won’t cost you much. Just mount the 1-liter bottle on the snow foam cannon, fill it with cleaning solution, and attach a pressure washer for the best results. You can adjust the spray angle, making it really convenient to wash your car, sidewalks, and even siding. It’s a great multi-purpose tool at a price you can afford! 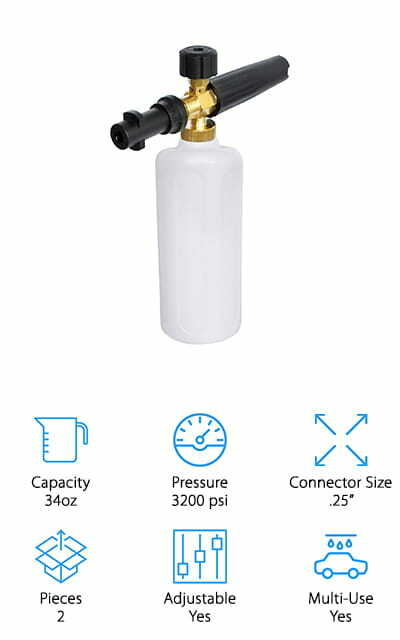 You can quickly attach and disconnect the pressure washer, another layer of convenience for people with busy lives. We love that you can see through the bottle, which allows you to know when fluid is getting low. The vertical jet nozzle can be set to be used in a side-to-side sweeping motion. This is a great affordable product! The MATCC Adjustable Foam Cannon is just about the best foam cannon for pressure washer use that we found in our research. At its maximum strength, it can handle up to 3000 PSI. There’s no way that any dirt will be left on your car when that’s through with it. Simply lather up your car with the foam first, and then use the nozzle to switch to the rinsing option and get it all off. Use a mitt if you feel like it still isn’t clean enough, but other than that your car will be as good as new. The core of the MATCC foam cannon is made of brass, and it’s solid and pretty heavy. You can switch between foam dispensing and rinsing really easily with the adjustments on the cannon itself. You can even customize how much foam comes out for different levels and types of clean. It connects and disconnects super quickly! 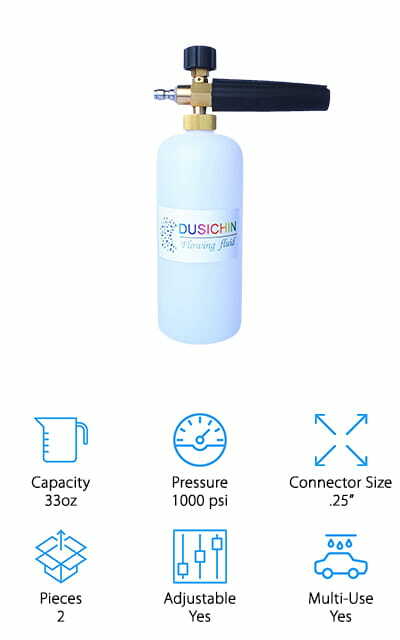 DUSICHIN’s Snow Foam Cannon is perfect for both professional use and the car washing hopeful. The foam lance is adjustable to different spray modes and patterns so you can get the perfect clean every time. The fittings and connectors are all made of grass, and the fitting to attach to the pressure washer is a ¼” quick disconnect feature. The bottle is 33 ounces and will last at least a few weeks. The height of this pressure washer is at 1000 PSI, and we think that it’s incredible that the fittings on this foam cannon can stand up to that kind of pressure. It mixes water and soap perfectly to bring you the best clean at the best speeds, with as little labor as possible. The design of this foam cannon is remarkably heavy-duty, so you can use it on the professional market as well as at home in your driveway. We love how simple it is to use! The Obecome Foam Cannon is a lot like the other products on our list, except it has a little bit of a wider application. You can use this device with a pressure washer to clean floors, walls, windows (which is a great idea), as well as driveways and roofs. It will even leave your siding looking spectacular when it’s finished. It puts out about 1000 PSI during peak usage, which is an incredible amount of power. All of the connectors are brass, and the foam cannon plugs directly into the gun on the pressure washer to make life easier for you. The nozzle is adjustable, and with the 33 ounce bottle, you won’t run out of soap anytime soon. Go get some outside cleaning done! You can adjust how much foam is dispensed, as well as the spray pattern. We love that! Not to mention that it really loosens and washes away a lot of the dirt on your car. The MTM Hydro Foam Cannon is one of the best-known and professional foam cannons on our list. It comes with a 34-ounce bottle to put the soap in. Soon there will be foam all over the place! The water flow from your pressure washer combines with air and the soap that you put in the reservoir to help produce really thick foam that will cling to your car and clean it without any work on your part! In fact, at its best, this foam cannon can shoot over 20 feet of foam. The bayonet fitting allows it to fit specific brands of pressure washers, so you should always be ready to take on any job. We love that this foam cannon is so compatible with Karcher products, so you don’t have to guess and try and find fittings or extra parts. You can get them all with your Karcher pressure washer. We love this cannon! The Chemical Guys Foam Cannon is unique on our list because it comes in a set with three bottles of soaps to help your car look its best. It comes with three different bottles of waxes and shampoos that will leave the surface of your car looking great, and you’ll be proud to be driving it around! All of these soaps rinse clean and leave behind no residue on your surfaces. With this kit, you really can give your car a great wash without ever having to touch it, which we think is pretty amazing! 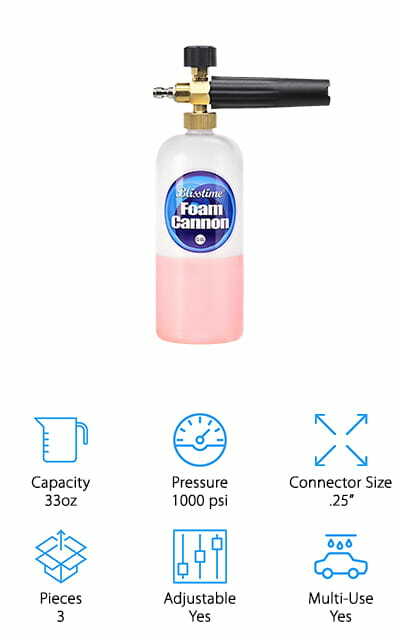 The foam cannon also works well with waxes and sealants, so you do not have to stick to foaming soaps with this device. Get all of the dirt off your car with 800 PSI of pressure – water hose foam cannons just can’t keep up! 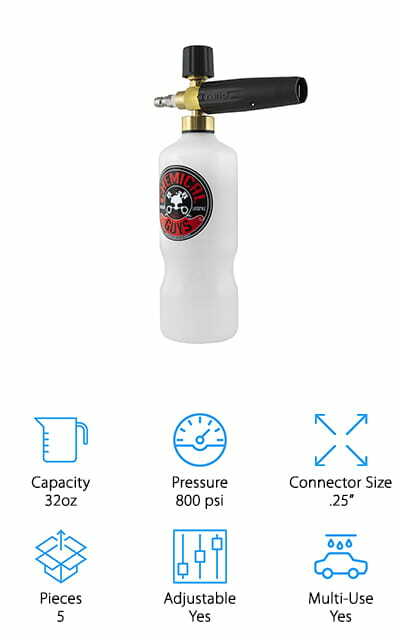 The tank is 32 ounces, so you won’t have to refill it as often as some others! The Blisstime Foam Cannon is great for cleaning all the surfaces that need to be cleaned! The foam is produced is incredibly thick and can get all of the dust, dirt, and grime off your car in just moments. It uses a pressure washer that can put out 1000 PSI, and once you have that, you’ll be washing away suds like a pro. 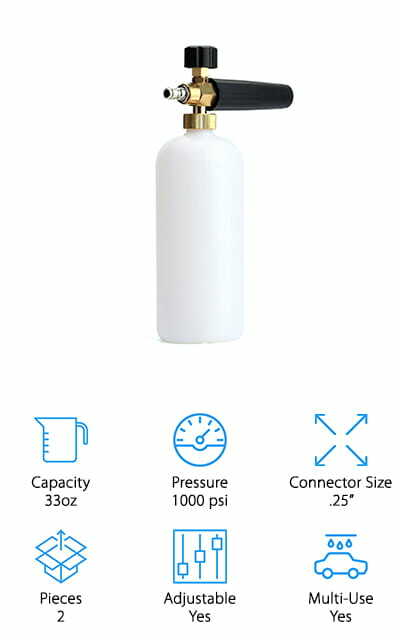 All of the connectors are brass, and the bottle is made of anticorrosive, thick material that won’t crack. You can also see the level of soap through the bottle. The bottle is 33 ounces, big enough to hold a few washings in soap. 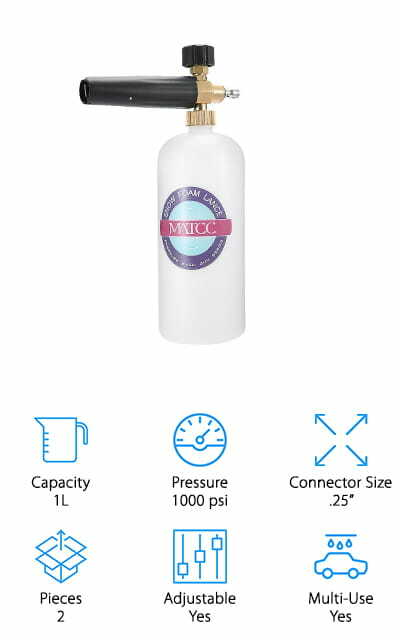 This is the best foam cannon for electric pressure washer use due to how it works and how much pressure it can put out. Ease your mind and get all the dirt off of your car while saving so much time, you won’t know what to do with yourself when you’re finished! the end of about six different Karcher pressure washers. The reservoir tank for the soap is 34 ounces, so you only have to fill it up after every third or fourth wash of your car. That’s amazing! The spray nozzle adjusts, so you can change the pressure and ratio of water and soap that comes out. The connectors are lighter than pure brass fittings, but they are solid high-grade plastic. You can easily see how much soap remains with the quick-see bottle. It produces thick foam that can get the dirt out of anywhere! The nozzle allows you to have a thin spray, as well as a fan to get in all of those tight spaces. It’s also resistant to any sort of chemical. What’s really amazing is the 3200 PSI of pressure this thing can handle – without cracking, I might add! The UCFOAM foam cannon can be used to wash windows, driveways, roofs, siding, floors, motorcycles and just about anything else you can think of as well as cars. Just put the cannon and the soap bottle on the end of the pressure washer and you can do all the washing you could ever hope to do! The lance is made of brass, and it’s heavy enough to make you react twice. Regardless, it’s super powerful – it has the capability of putting out 3-times more pressure than the other on our list. 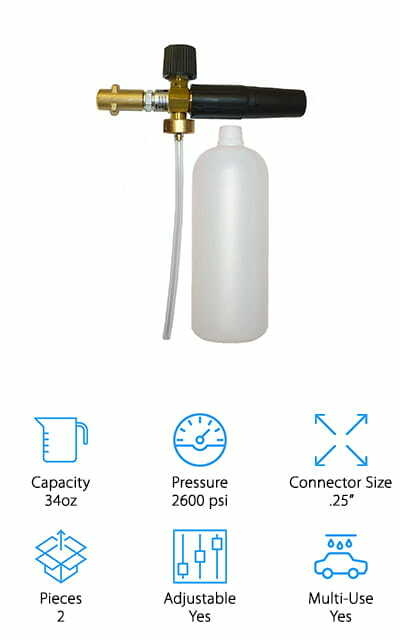 The tank on the nozzle can hold 1 liter of soap, so you don’t have to refill as often when doing big projects. The spray nozzle is variable and adjustable, so you can get the greatest foam generation every time. You can thicken and thin out the spray as well from that nozzle. It’s pretty cool! We also love that they suggest you use it just about anywhere!